Why should I escape the artist’s ever watchful eye? 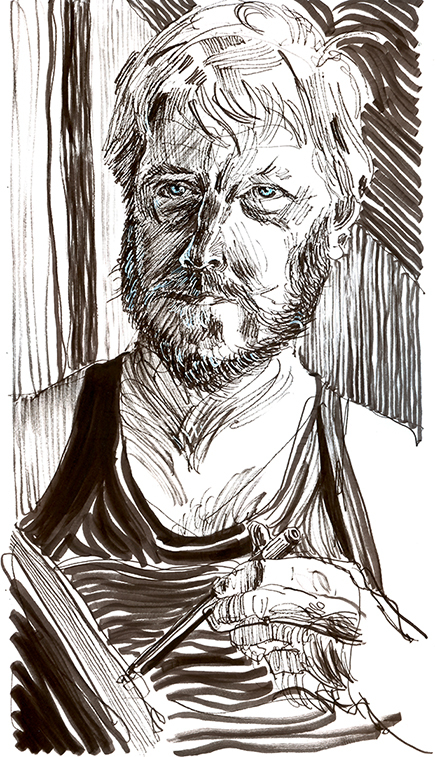 Here is a self portrait, drawn in the workshop on the 24th of January 2014. This entry was tagged Nova Scotia, self portrait, studio work. Bookmark the permalink. What a great self-portrait. I love the line work, and that you’re pictured drawing. This made my day! Wow thanks! Thank goodness for follow bloggers who lend their support. You made my evening, or is it day? I really should turn in for the night. Thanks again, Russell. Wonderful, love the touch of blue! Thanks Boxer. Good to hear from you, Russell. Probably Jo, or at least of the same ilk ;-) Take care, Russell. Terrific self portrait with your characteristic expressive lines! I’m sure you’ve seen Van Gogh’s drawings? This reminds me of his work as well with all the different line quality. Love the hint of blue in your eyes. Thanks Jen. Yes, I’m a big fan of Van Gogh. I like making those sculptural marks with a pen, and find it relaxing. Thank you for dropping by, Russell. Thanks Rosie. Well, I am a bit deranged but I’ve still got both my ears :-) Russell. Thanks Narelle but truth be known, I’m a bit rough around the edges ;-) Russell. Yep that’s me, warts and all! Russell.